Homemade soups made with fresh stock are highly nutritious and a great way to stretch your food dollar. 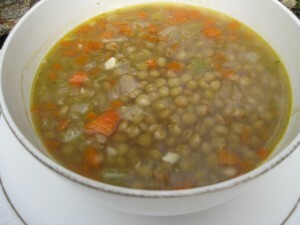 This is a simple inexpensive and delicious lentil soup recipe. Enjoy! 1- 1 cup of uncooked organic lentils ( soak in water overnight at room temp.) this will turn in to 3 cups of lentils. 1- Place large pot over medium heat. 2- Add olive oil, garlic and shallots. 3- Sautee over medium heat until they are translucent, ( about 2 minutes), stir frequently. 4- Stir in carrots, celery, salt and pepper. 5- Cook until the carrots are soft, approximately 5 minutes, stirring frequently. 6- Remove lentils from water and rinse under cool water. 8- Add stock and water. 10- Reduce heat, stir, cover and simmer for 1 to 1 1/2 hours or until lentils are soft, yet firm. 11- During the cooking process skim the top of the soup from time to time, to remove any foam that forms . 12- Some of you may want to add more salt, that’s up to you. This entry was posted in Recipes, Uncategorized and tagged celiac recipes, Frank Baldassare, Frank Baldassare the missing ingredient, Gluten free Lentil Soup recipe, Gluten free soup recipes, The Missing Ingredient tv gluten free recipes. Bookmark the permalink.